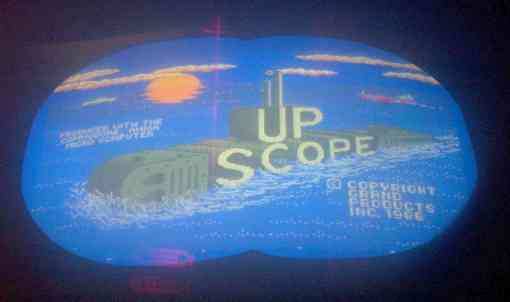 The Up Scope is actually an arcade machine based around the A1000 motherboard and a special EPROM daughter board (there are references to it using an A500 motherboard, but this is incorrect). The game itself is housed in a unique cabinet shaped like a submarine's periscope with two buttons on the left and right handles which are up, down and two fire buttons. The idea of the game was to attack the sub hunter whilst sinking as many ships as possible. If you missed the sub hunter you went into battle with it where it dropped depth charges whilst you waited to fire a torpedo. Page contributors: Ola Jensen, Peter Gordon, Steve Flock.